surf2create: Repurposed cabinet used as a mosaic project. Thrift Store find for storage and mosaic project. 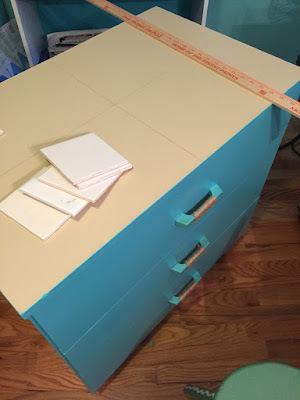 When I started designing my craft room, I decided to use them in my craft room. They are great for storage! 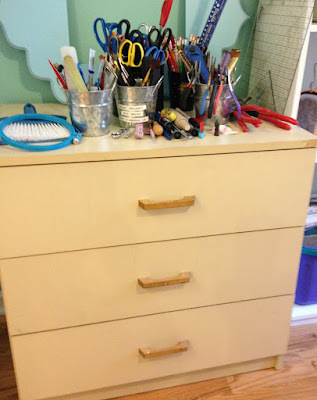 The tops of the cabinets, I realized, would be great for displaying items or convenient for working on projects. I first painted them an off shade of the green I used on my walls. 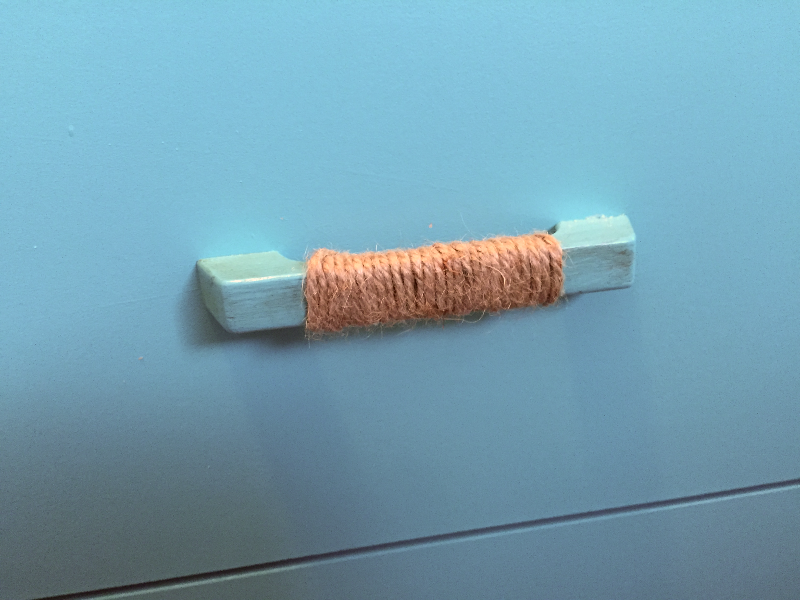 I also used the twine theme in my room to accent the handles that were originally made of brown wood. Cabinet handles painted and added twine. Something was missing! I felt like the cabinets needed more color and I had been itching to do a more complex mosaic project. I found colorful ceramic tiles at Hobby Lobby. Ceramic tiles from Hobby Lobby. Now for a design! This was rather difficult for me, as I've said before, I am not an artist! But, with the help of my husband's artful eye, I came up with a design I loved! I removed the paint from the top of the cabinet before I started. This isn't a 'How to' post, but below are the tools I used. You can not do a project like this without them! Determining the design and cutting the tiles was the most challenging part. It took a while to get the hang of cutting the tiles and get the fit with them I needed. Once I had my design created, I glued down the tiles. Then, grouted the top. Presto! Add grout to the mosaic project. One cabinet down, one to go! 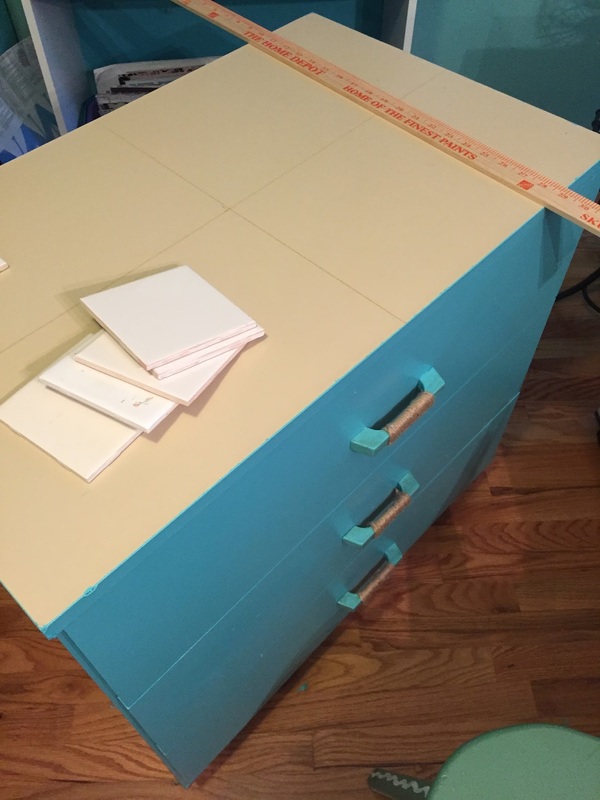 Watch for another post soon on what design I added to the second cabinet! I actually have a design in mind this time!